3 Layers Waterproof Makeup Travel Bag 15.1 Inch Makeup Train Case Makeup Bag Organizer with Adjustable Dividers for Cosmetics Makeup Brushes Jewelry Digital Accessories (Black-M) by LEPO at The Black Pearl. MPN: LE-45. Hurry! Limited time offer. Offer valid only while supplies last. This makeup travel bag is made of high quality Oxford fabric, durable, waterproof and shockproof. You can adjust the removable baffle as you need to keep all the things in neat and tidy. Many ways for you to carry this makeup travel case. You can hang it on your shoulder, take it in your hands, use it as a backpack, or hang it on luggage case, very easy to take it with you. It is a perfect handwork. Firm zipper and metal ring helps you to use and carry it in a comfortable way. Size: 15.1'' x 10.6'' x 5.5''. 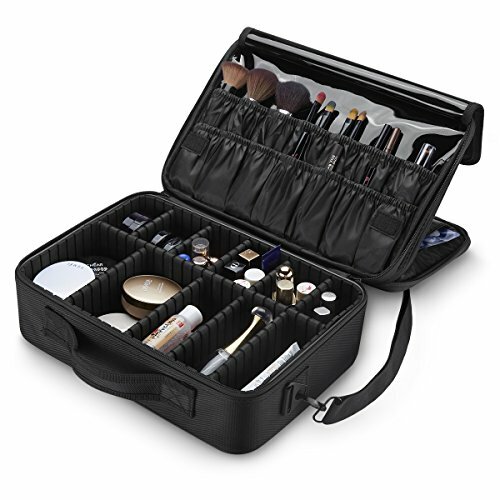 This makeup bag has several compartments and makeup brushes slots, which provides enough space to store many things.